With Fall upon us, our inner fashionista is dying to bring out the fabulous boot collection we've acquired over the years, but unseasonably warm temperatures make the boot a liability. The have-your-cake-and-eat-it-too solution is the bootie, the season's must-have accessory that gives the look and feel of a boot, but with a little breathing room for your gams. Pair with mini-dresses, short skirts, or skinny jeans, and choose booties made of leather, patent-leather, or suede. 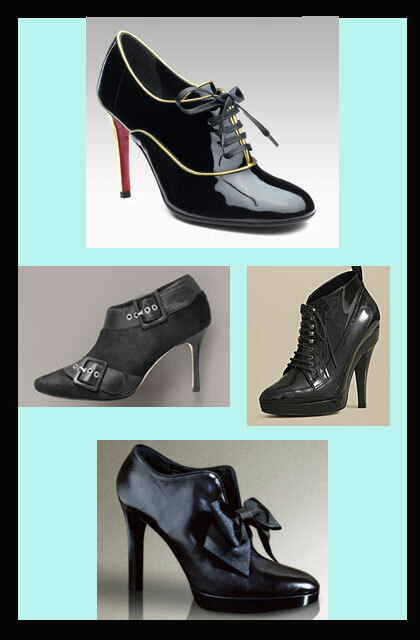 We like Ralph Lauren’s black Dillynn calfskin bootie, with a seductive high heal, and a perfect size black bow. For the rocker girl in you, go for Manolo Blahnik’s suede Hair-Calf Ankle Boot with two big buckles – none resembling that of captain hook – these are great with super short minis, and come in fab fall colors. And of course – Christian Louboutin’s Miss Fred is the perfect patent-leather version of this fall must have. For the classic girl, Burberry’s more original Victorian Bootie with a thin lace up, spiked high heal, and glossy patent leather shine will prove you are perfectly en vogue.